Temple Run 2 – an App Store Editors’ Choice – plays much like the original, but there are a lot of improvements that make it so much better. The first thing you’ll notice when you start playing is how beautiful everything is. It makes the original look like it belongs in a museum. All the characters look great, the environments are lush and full of colour, and the monkey is larger and even more frightening. 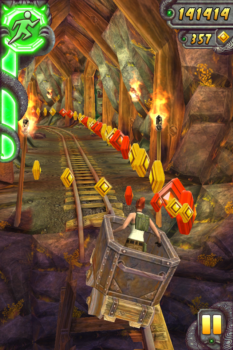 Temple Run 2 may be one of the best looking games on the App Store. Obstacles are now dynamic, and much more exciting. You’ll still be avoiding classics, such as the jet of fire, but now rotating wheels covered in large sharp spikes, rushing rivers, zip-lines, and mine shafts with low beams, missing rails, and dead ends are thrown into the mix. The variety of obstacles really add to Temple Run 2’s replay-ability. I’ve spent hours playing Template Run 1 and 2, and I definitely prefer the latter. I like the addition of the Gems, which I spent when save myself after dying, and to lengthen powerups. Also, I thought having a special power attached to each character was a great addition. Once I collected enough coins to fill my power meter, I could boost, activate my shield, or collect additional coins or gems, depending on which power I had assigned to my character at the time. Temple Run 2 runs really smooth, but at the expense of your path and the background popping in late. This doesn’t affect gameplay, it’s just a little annoying. 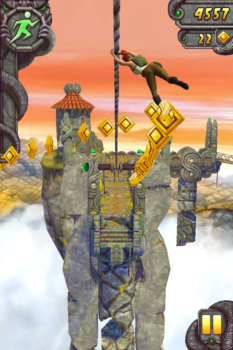 Temple Run 2 has really improved from the original. It’s not only better looking, but more fun to play. Just a couple days ago, Imangi Studios announced Temple Run 2 had already surpassed 20 million downloads. You can download Temple Run 2 for free from the App Store here. Then let us know if you enjoyed taking the idol, and running for your life, again.